Heat oven to 350°F. 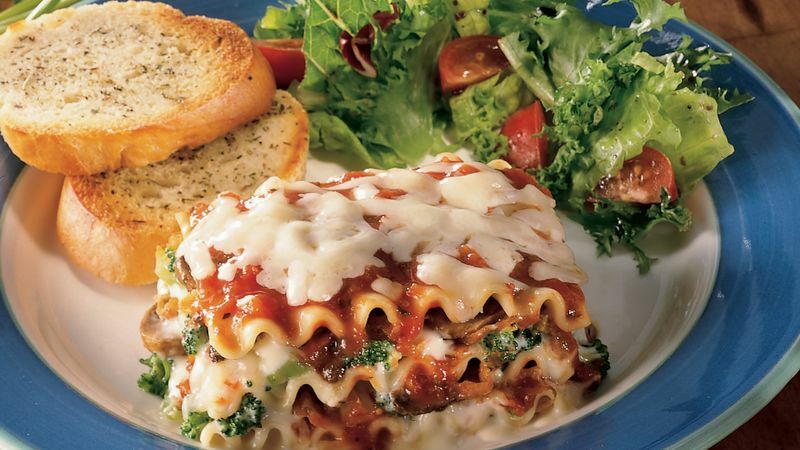 Cook lasagna noodles as directed on package. Drain. Meanwhile, in medium bowl, mix tomatoes, basil, oregano and garlic. Reserve 1/2 cup Parmesan sauce. In another medium bowl, mix remaining Parmesan sauce and broccoli. In 10-inch skillet, melt butter over high heat. Add mushrooms and carrots; cook 4 minutes, stirring frequently, until tender. Spoon and spread reserved 1/2 cup Parmesan sauce over bottom of ungreased 13x9-inch (3-quart) glass baking dish. Top with 3 cooked noodles. Spread half of broccoli mixture over noodles. Top with 1 cup of the tomato mixture, 1 cup of the mozzarella cheese and half of mushroom mixture. Repeat layers, topping with remaining noodles and remaining tomato mixture. Cover tightly with sprayed foil. Bake 50 to 60 minutes or until hot and bubbly. Remove from oven. Uncover; sprinkle with remaining 1 cup cheese. Let stand 15 minutes before serving.